Featured Resource- Jesus.org: Your Questions. Real Answers. Do you have questions about Jesus Christ? Jesus.org offers real answers to some of the toughest questions about Jesus and his life, death, and resurrection. It features notable theologians and authors such as Alistair Begg, Albert Mohler, R.C. Sproul, Greg Koukl and more! Much of the content deals with common objections that are often brought up by unbelievers and cultists. Check out Jesus.org for great answers to some of the most important questions you will ever ask or be asked! During an apologetics conference I attended this past weekend, a few of the speakers made reference to a gentlemen who was predicting that Jesus Christ was returning to earth on May 21st, 2011. Honestly, I didn't give the matter much thought until a friend recalled the date when I told him I was preaching at our local church on May 22nd, 2011. I jokingly told him that I wouldn't need to prepare and thought nothing more of it. 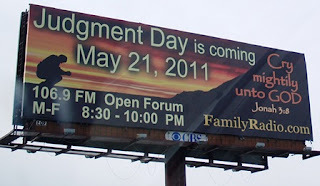 Then this evening, as I was driving to my Mom's house for a visit, I actually drove by a sign that looked something like the one pictured here informing drivers that "Judgment Day is coming May 21, 2001." After doing a little research I found out that the gentlemen making this prediction is named Harold Camping and he apparently made the same type of prediction in 1994! Needless to say, he was wrong. Charlie Campbell of Always Be Ready Ministries has written a response to Camping and his followers that can be found here. I'm fairly sure that the Father hasn't let Harold Camping in on the date...I think I'll go ahead and prepare my sermon. Why is it permissible from a scientific standpoint for thinkers such as Richard Dawkins or Stephen Hawking, based upon empirical data and observations, to infer that the design we observe in nature is an illusion, but when thinkers such as William Dembski or Robin Collins make inferences, based upon empirical data and observations, that the design is a reality, they are being unscientific? Please feel free to share your answers via the comments.